TE Rob Gronkowski is the best player in his position hands down. Fantasy owners try and draft him #1 each season and it is easy to see why. His stats, when healthy, are off the charts. At 6’6” and 265 lbs., Gronk towers above opposing corners and safeties creating a nightmare scenario for defensive coordinators. Unfortunately for the Pats, Gronk took a nasty hit in the AFC Championship and exited the game with a likely concussion. Now, the Patriots released their injury report and the tight end is listed with a concussion. If he is not cleared to play in Super Bowl LII, the Patriots will have a major gap in their offense. In the AFC Championship, Gronk has harassed by Jalen Ramsey, A.J. Bouye, Barry Church and others throughout the entire first half. Their presence was felt, as Brady was only able to hit him successfully once on a catch for 21 yards. Gronkowski almost had a nice deep grab late in the first half, but Jaguars safety Barry Church laid him out. After the play was called dead, the Jags’ secondary was celebrating while Gronk was slow to get up. When he did stand, he looked flustered and ended up being taken into the Patriots locker room. He was later listed as not able to return via “head injury.” After Gronk’s removal, the Pats offense was slow to get going. If it were not for fourth-quarter Brady and a valiant effort by Danny Amendola, we may have seen a Jags-Eagles Super Bowl. 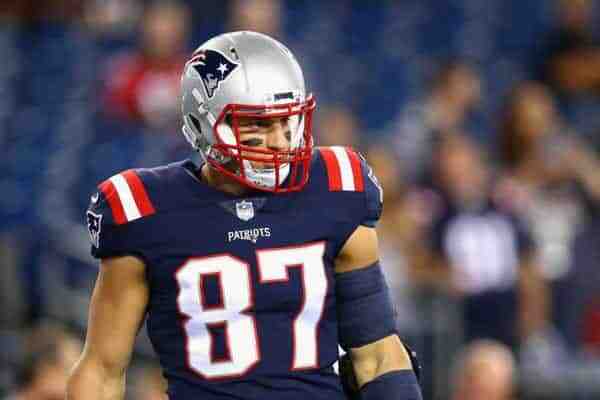 Gronkowski leads all Patriot receivers, as a tight end, with 69 receptions for 1,084 yards and 8 touchdowns. Those are just his regular season numbers. In the postseason, which has been only 2 games for the Patriots, he was hit 7 times for 102 yards and a touchdown. With WR Julian Edelman out of the picture with an injury, there is no denying the urgency for Gronk’s presence on the field. Even if he is not targeted by Brady, he will be by the opposing defense. Teams will often double team him, and the safety always has his eyes on Gronkowski nearly every play. In the event of double coverage, other wide receivers like Danny Amendola, Brandin Cooks and Chris Hogan open up. Without him on the field, corners and safeties can focus their attention elsewhere and not have to worry about the force of nature that is Rob Gronkowski. There is one thing important to note with the Patriots’ injury report. The team did not practice ahead of the report. This IR is based on a practice-projection, meaning that Gronk would have not been active should they have held a regular practice. This is the first formal instance of him being listed with a concussion, so it is not good news for Pats fans, especially those looking to legally bet online. Per the NFL rules, Gronk must be cleared by an independent neurologist in order to be allowed to play in Super Bowl LII. There is still time before February 4, but for those placing Super Bowl bets on the Pats, knowing whether or not he’ll play will make a difference.